I am thrilled to share that my campaign has been endorsed by Afscme Council 61! I am honored to receive this endorsement and I am grateful for the vote of confidence that has been placed in me and this campaign. 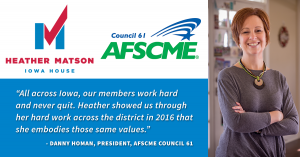 When I made the decision to run for the Iowa House last cycle, AFSCME Council 61 was one of my earliest and most steadfast supporters. I am proud of our long history of working together to support public employees and I am beyond grateful for their decision to stand with me again. Fighting for policies that will create economic security for working families, restoring collective bargaining rights, protecting IPERS, and passing responsible budgets that fund our priorities are central values of my campaign. I am proud to stand with the men and women of organized labor as we work together to bring real change to the Legislature. It’s time to invest in Iowans again, and I am thrilled to have the support of AFSCME Council 61 as we work to make these investments a reality. Learn more about the campaign and how you can help at www.matsonforiowa.com.